﻿A whole meal in itself, I just love a plain chicken soup to take the chill out! My grandma and mom knew how to make a banquet out of a few ingredients and to us, this shouts comfort and you can add as much as you want to this recipe to make it a whole meal. Grandma loved making her soups. They sure were hearty in flavors. It always seemed like the chickens had more flavor when I was growing up and the meat was tastier than it is now. This soup brings back many memories as she has been gone since the early 1970s. Chicken has always been economical meat to use for meals. Grandma grew up in the depression days. She would use the chicken (bone in) to make broth for many other meals. I remember her using the broth for stews, gravy and to flavor even sauces. Nothing went to waste and she fed many people, being all Italian from Rome Italy that's a characteristic of their personality, everyone must eat! Sometimes the kids from the block and friends would join us. Use Any Kind of Chicken? Grandma likes to use thighs or legs, she said it had more flavors. Sometimes I use breasts meat because my family likes that part of the chicken best, but she's right about flavor! 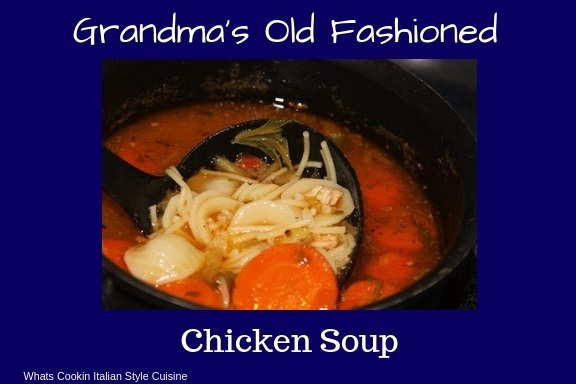 Grandma's Old Fashioned Italian Chicken Soup always is a comforting memory, the smell, flavors, and rich soup is a keeper for me! You can use any chicken really, pasta's shapes, vegetables and greens, anything can go in a pot of soup you like! This is a basic old fashioned plain soup recipes. Watch How Deliciously Rich This soup Looks! No matter what ailed us Grandma's soup was being made, long after she passed on. 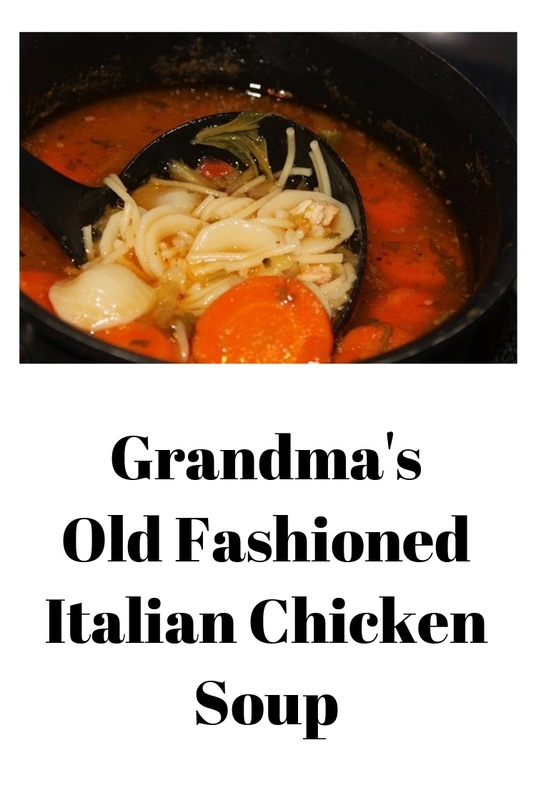 Grandma's Old Fashioned Italian Chicken Soup was the best and I treasure those days. I still make it for my family whenever they have the sniffles and it's the most asked for soup at every Holiday table here as well. 1/2 teaspoon of each (use 1 or 2 leaves fresh when possible) oregano, garlic powder, thyme, rosemary, fresh basil, black pepper and a pinch of cayenne pepper. 1/2 lb package pasta any of your favorites, broken up spaghetti, pastina, rice, noodles, baby shells, orecchiette pasta, wagon wheels, alphabets, orzo, acini de pepe, cooked separately until tender in salted water. Drain. In a large saucepan saute garlic for two minutes in 1 tablespoon of olive oil. Add Chicken and 4 quarts of water, boil for an hour, skimming off the top as it cooks to get a clear broth. Put on low to simmer. Take chicken out cool and pull off the bone into pieces put back into the pot. Add all the vegetables and seasonings. Simmer until vegetables are soft. Add cooked pasta. Just before serving add 1/2 cup of Romano grated cheese into the pot and serve with garlic croutons or crackers and more cheese on top. Don't Forget to Check Out my Soup Recipes Below! Delicious! Nothing says comfort quite like chicken soup! I like plain chicken noodle soup, but Bev is not a fan, but with the addition of tomatoes, I'm sure she'll go for this as will I. Can I have a bowl? My cold won't go away. Grandma sure did have some great recipes! This does steal my heart - love chicken soup in all its glory. Perfectly spiced, delicately herbed - and that ladle says it all - pure goodness. Very similar to my mother's and mine - so of course I approve and would love some for breakfast. Nothing like chicken soup, I usually cook it in the French method with the aromatics and a bouquet garni but I'll have to give this recipe a try. Thanks for sharing this wonderful, warm recipe! Although my Nonna made a tasty chicken soup...somehow my Grandpa managed to make it better. This is soup for the soul Claudia! Nourishing and comforting! Chicken soup is so good, especially on a cold night. Chicken soup from your Grandma's recipe is priceless. Chicken soup is the best. I could go for a bowl of this soup right now. I am getting hungry just reading through the ingredient list. What a perfect comfort dish. I don't usually use tomatoes in chicken soup but this does look fabulous. This looks yummy! Grandma's recipes are always good, isn't it? Right now, I am down with cold and all I want is just a bowl of satisfying soup like this! Now, you're gonna have me in tears, Claudia! Nothing like soup that Nonna used to make, and you have managed to save those beloved old recipes! Chicken soup for the "soul! "...big time! Claudia - This is sooooo comforting. Wish I could just grab a bowl for supper. I'm convinced it will cure whatever ails you. Looks yummy! Nothing like Chicken Soup, delicious and comforting. This is the kind of soup that warms the soul! Nothing beats soup the way Grandma makes it! Yum! Nothing more comforting then a bowl of chicken soup! I have this scheduled for tomorrow night. I am sure, we are going to thoroughly enjoy it. Sounds delishious. I remember going to the market with my grandmother and buying chicken feet. She would make the most wonderful soup with all these chicken feet floating in it :) You cant find chicken feet anymore. You can't beat a comforting bowl of soup and homemade is always best. I love chicken soups. This reminds me of when my Mom makes soup, she always cooks it with the bones in. So excited for soup season to begin! This chicken soup reminds me so much of my mom's! She never used tomatoes though - bet it's delicious! What could be more special than your grandmother's recipe! :) This looks delicious and so nourishing, thanks for sharing! I love a big bowl of chicken soup, and am always looking for different recipes to try, so this is wonderful! Thank you! THIS is perfect for fall! We are HUGE soup fans and I can't wait to try this! Yup...those grandma's know what they are doing. Mine sure did...and I miss here cooking so much. Now that I am a gramma...my grandson often tells me "you are a good cooker gramma" LOL. This soup is the best when you are not feeling well. Like a hug from gramma in a bowl. This is indeed a hearty and filling soup.And I too find that stuffs that my grandma cooked were far more delicious and hearty that what I cook now, even if it is the same recipe! Grandma's right about the thighs and legs. Perfect for soup making. I like your version, it's different from mine, so will be trying this recipe when I get a soup craving. Love those grandma recipe - there is always something so homey and nutritious about them. Love the flavors in this soup and look so delicious. That broth looks sooo perfect. Healthy to the bone! This soup heals everything and I mean EVERYTHING Love this old grandmas recipe. Our grandparents were so smart about food they ate. That's why my grandma is 90 and still kick it! There is nothing to compare to good old chicken soup. My mamma made the best and I swear that just a few sips cured me of anything that ailed me. This soup I can see why it would be a cure-all. This soup brings back such good memories.. My Nana made this kind of soup whenever i was sick.TO think that this recipe is that old it really is a piece of history! This looks like the soup I used to enjoy as a kid when I was sick. Absolutely delicious! I hadn't saved the recipe from my Mom, I'm definitely saving this one though. Good Chicken soup is needed for the when we are down little bit. Grandmas recipes are always precious, best part is that taste is guarantied . Glad you are keeping the tradition.